Jay is a member of the National Association of Insurance and Financial Advisors (NAIFA). NAIFA is a national nonprofit organization representing the interests of more than 70,000 insurance and financial advisors nationwide, through its federation of over 900 state and local associations. Founded in 1890, NAIFA is the nation's largest financial services membership association. Certified in Long Term Care (CLTC) designation. Jay is both a qualifying and life member of the Million Dollar Round Table (MDRT), the Premier Association of Financial Professionals. Jay was awarded membership in 2006 and has been a member every consecutive year since. 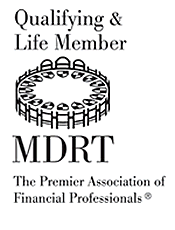 Founded in 1927, the MDRT is an international, independent association of more than 49,500 members or less than 1% of the world's most successful life insurance and financial services professionals from 500 companies in 70 countries. MDRT members demonstrate exceptional professional knowledge, strict ethical conduct, and outstanding client service and are provided with resources to improve their technical knowledge and sales. MDRT membership is recognized internationally as the standard of sales excellence in the life and financial service business. Representing Northwestern Mutual since 1996.